All I saw were the hind legs and tail disappear over the wall. In an unexpected display of fearlessness, she'd jumped the wall and dropped a good three metres into the harbour. I thought she knew about water, but what would I know. I heard him before I saw him, heard him say 'I'll get him" as he pulled off his shirt. Mid-teens, fit as a fiddle, and beaming an uncertain smile. I don't think he knew exactly what to do either, but he wanted to do whatever it was. "Thank you. Thank you very much. What if you get over and I hold your arm and then you might be able to reach her with your other arm. And he's a her. She not two yet." We tried that, but were a long way short. "I'm going in" he said stripping down to his shorts, and then he was beside her, reaching out to her, and took her in his arms. "I don't want a bull shark to get her" he called up. I don't want a bull shark to get you, I thought. He carried her carefully down to the wharf, his father and his brother now looking on. His father seemed mighty proud. "I don't want a bull shark to get her" he repeated, more than once. 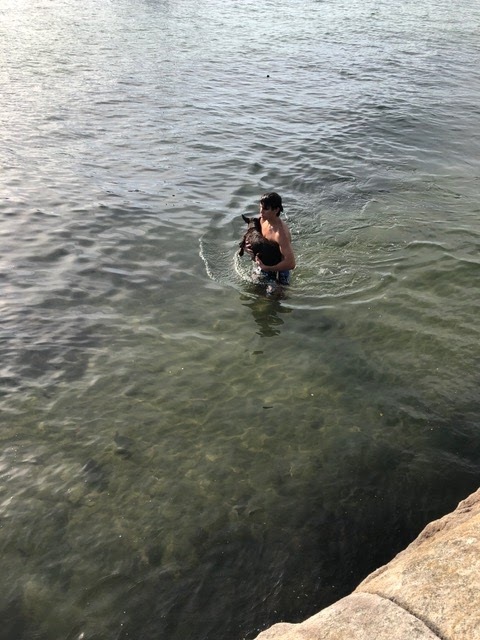 "I don't know how I can ever thank you" I said to his father after the rescue was done, and he'd gone off down to the boasted to clean himself up. "Whatever can I do. Is there anything he'd like, or needs?" "Some shoes" said his father, visiting from Melbourne, their yellow hire bikes lying on the grass. "Some shoes".